Some of the most exciting innovations in transportation and virtual reality are happening in tech communities far from Silicon Valley. Enthusiasm for entrepreneurship and the steep cost of living in Silicon Valley and the San Francisco Bay area generally is stengthening startup communities in unexpected places. These startup hubs are popping up throughout the country in large cities like Austin, Denver and Los Angeles, as one might expect, but some of the most innovative groups across different industries are carving out names for themselves in smaller cities and counties. The tech meetup in Santa Cruz, Calif., has members focused on building next-generation transportation technologies, the Santa Cruz Sentinel writes. Santa Cruz native JoeBen Bevirt, head of Joby Aviation, is developing an impressive and potentially change-making vertical take-off and landing aircraft. A meetup for Hudson Valley developers, entrepreneurs, designers, startups, and “anyone interested in technology” boasts big-time sponsors like AT&T, and O’Reilly Media. Tech Talent South, a New Orleans meetup, offers “Kids Code Mondays,” where children ages 9-13 congregate for an afternoon of different coding topics each week. Hawaii Governor David Ige was the guest at the HNL Newtech meetup in Honolu recently. The talk featured an open discussion about what's working, and what's not with Startup Paradise, the branding and promotional initiative that includes collaboration from major players in Hawaii’s innovation sector. Other meetings have concentrated on design and fashion innovation in Hawaii, and how best to leverage islands' unique lifestyle as a global brand. Orange County, Calif., is often overshadowed by neighboring tech hubs Santa Monica and Silicon Valley but it is building an innovation footprint, as well. The region is home to some large exciting companies like Blizzard Entertainment; was the founding location of the VR mega giant, Oculus; is the home of the cyber security company, Cylance; and home to Kobe Bryant’s Venture Company, Kobe Inc., amongst many others. What’s most exciting about Orange County is that startup incubators and workspaces like Eureka Building and UCI Applied Innovation are serving as home for large entrepreneurial communities. One such community is OC Tech Happy Hour (OCTHH). From humble beginnings as a small meetup where techies (engineers, developers, designers), entrepreneurs and investors alike would gather at local bars and restaurants to hang out and talk about their latest projects. 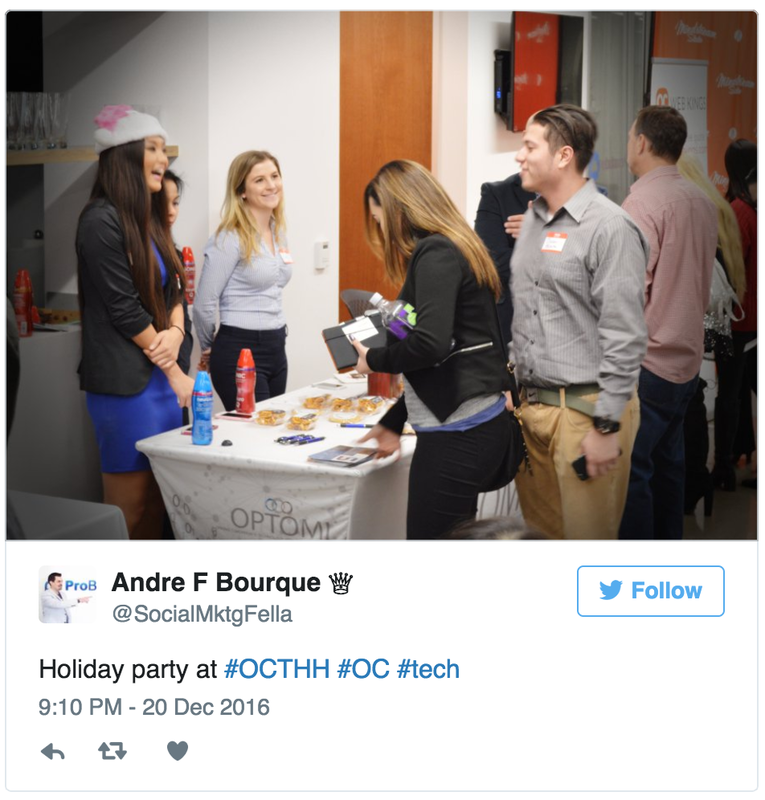 Founded in July of 2014, OC Tech Happy Hour has quickly become the largest and most active tech meetup group with more than 5,000 members, and a regular series of large-scale events that attract 300 people each time. The group is supported by important ecosystem resources like IBM for cloud computing resources, Orange County Code School which provides software development training and currently has a 100 percent graduate hiring rate, as well as the very important app development company OC Web Kings which works with startups and larger companies alike to make their sites and apps affordable. A recent event, [Funding + Growth] OC, LA, Silicon Valley attracted some very prominent panelists in the world of venture investing including Adrian Fenty, the former mayor of Washington D.C. who now serves as special advisor to the Venture Investment giant, Andreesen Horowitz, and others. Local business support is critical to the success of these inventive tech communities. “The group wouldn’t exist without local support from businesses that are making a serious impact in the community,” said Decker. And it's true for each of these emerging, regional tech communities. Local fuels national, and it's true for innovation.